An option of reusable hearing protection other than EAR Express Pod Plugs is EAR Ultra Fit Earplugs. Not only do these earplugs reusable, they are also washable! Made of non-toxic and non-allergenic advance polymer material, the earplugs are safe and hygienic to use as well as very comfortable and durable. EAR Ultra fit earplugs are designed with triple flange look that hugs the ear canal, which therefore increases attenuation. The longer stem functions as the holding area when user wants to insert or remove the earplugs. This way the earplug surface that is in contact with ear canal does not get dirt that may be unhygienic and dangerous for ear health. 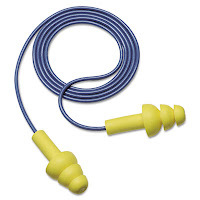 These corded earplugs reduce noise up to 25 dB and comply with ANSI S3.19-1974/CSA Z94.2. If you need reusable hearing protection with design that is safe for ears, EAR Ultra Fit earplugs may be the answer.